The dinosaur is one of the most memorable origami I made because my classmate Renzel is going to transfer to another school and it's his last day. I forgot and did not bring any remembrance I only had skill and paper! My classmate was a boy so I thought of making him a dinosaur. It actually resembles him because he is actually the dinosaur of our class. That is what I gave him and i wrote messages on the dinosaur and I told him he is the dinosaur of our class. He laughed - at that time we were all crying and that is the only thing that made him laugh. 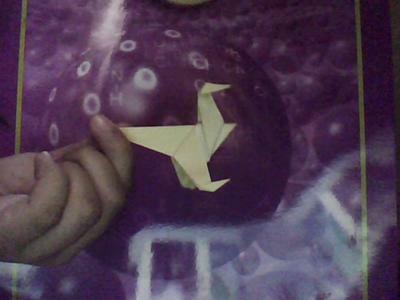 I think the dinosaur is found here on Origami-fun. pretty good...but do you reckon it looks like a kangaroo? Wow impressive! Can you show me how to do that? little dino is looking nice.